What is an onboarding process and why is it important? Onboarding processes lay out the steps for how new employees are integrated into an organization or how a client or customer is familiarized with a product or service. Statistics show that companies with effective onboarding processes have higher employee retention rates and saves them time and money. How can this process be structured for success? An onboarding process is similar to meeting someone for the first time. You want to make a good impression. This is an opportunity for the company to reflect their values. Effectively communicating to the employee saves time, minimizes not seeing eye to eye down the road, and helps keep both parties on the same page throughout the course of the relationship. Including as much information as possible allows for a mutual understanding of expectations, goals, timelines, etc. This should answer who, what, when, where, why and how. Given that this can be a lot of information to digest, communicating those things in an organized way makes it easier to reference, and therefore more useful. In addition to being organized, information is only beneficial if it’s accurate. As the company, role or project changes, any documents should be updated to reflect the current status. Referencing correct information avoids confusion and can prevent errors. Although, being that we are all human, mistakes are inevitable. Setting up routine check-ins to exchange feedback can reveal problems and show progress (or potentially the lack of). These types of structured meetings encourage the continual flow of open communication. Not every new employee is going to have the same experience level or skill set. Being aware of those differences allows the company to customize particular onboarding steps in order to better support the employee’s integration. Customizing can involve including/excluding certain information to fit the employee’s experience level, or adjusting the timeline based on the knowledge gap between employee and their new role. For temporary employees including consultants or contractors, the length of their employment with a company is on a shorter term basis, therefore the process of integrating into a new company can occur multiple times a year. Not only does the frequency increase, but the length of time allotted to ramp up on a new project within a new company is limited. Instead of a few months to onboard, the timeframe can be as short as a few days. Due to these additional constraints, providing information early on allows the employee to better prepare by familiarizing his or herself with protocols or necessary tools. Under tighter circumstances, the qualities previously listed become even more essential to achieving efficiency and maximizing time. 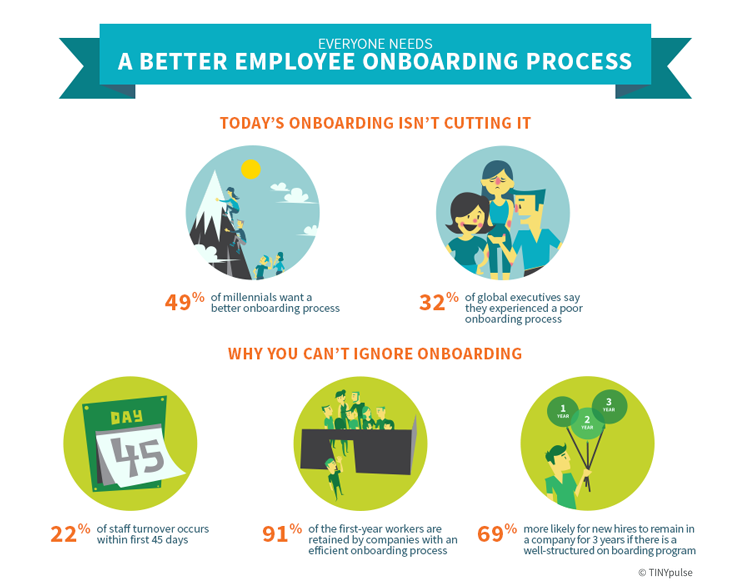 Knowing the value of an effective and customizable onboarding process hopefully encourages companies to reevaluate their onboaring process, to create a more enjoyable experience for new employess, both full time and temporary.